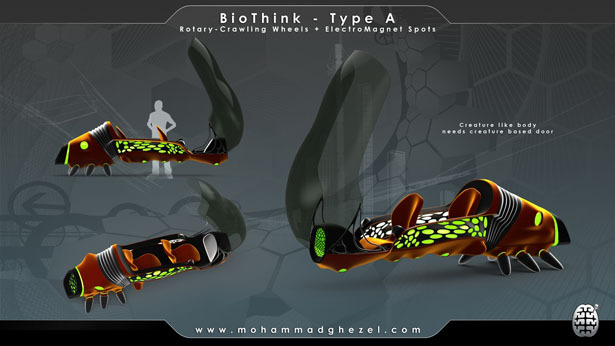 BioThink, a futuristic vehicle for future mega-cities where we need sufficient and sustainable transportation for personal mobility on the streets. 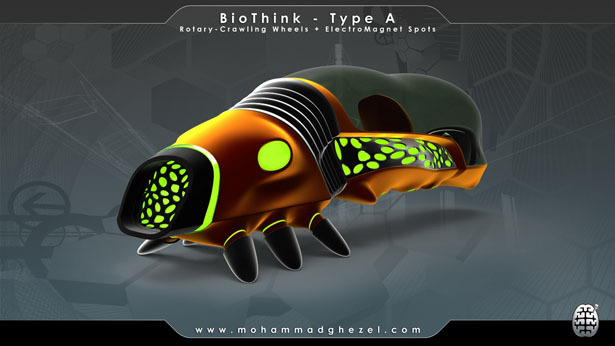 BioThink has been designed with 2 models (type A and type B) which both are smart vehicle with AI for future mega-cities. 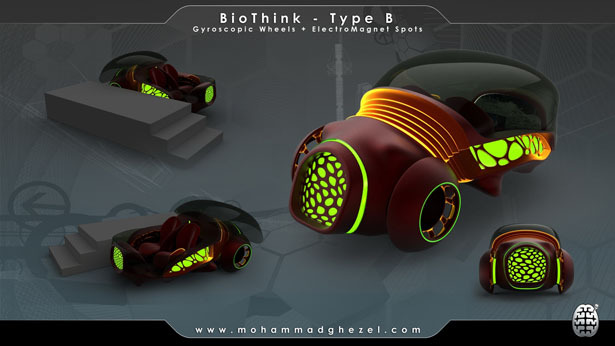 Only the owner of the vehicle can access it because BioThink is equipped with DNA Security Key, therefore, each vehicle is completely custom made for the owner not for anyone else. 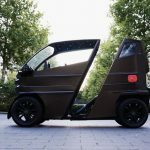 The type A is 2 passengers vehicle with bionic form and mechanism that provide speed, safety and comfort due to its nature’s design. 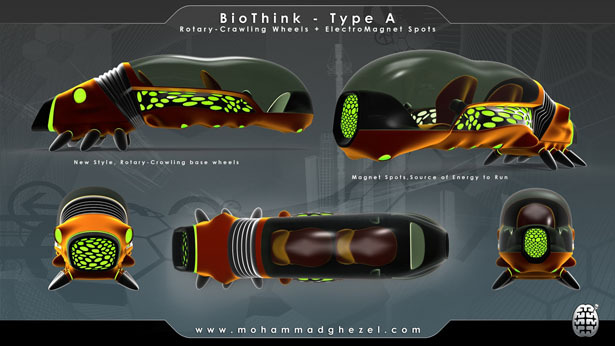 It features Rotary-Crawling wheels that get its power from solar energy transformed into electricity and magnet for future roads. 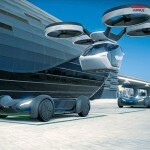 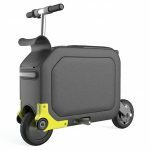 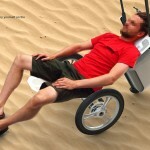 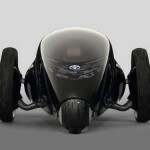 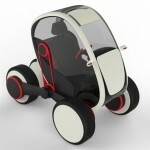 The type B features Gyroscopic wheels that utilize the same solar energy to power itself. 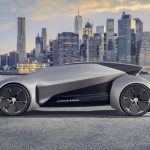 The designer vision of future road, it’s equipped with intelligent traffic system that prevents any crash, you won’t be dealing with traffic jam or whatsoever. 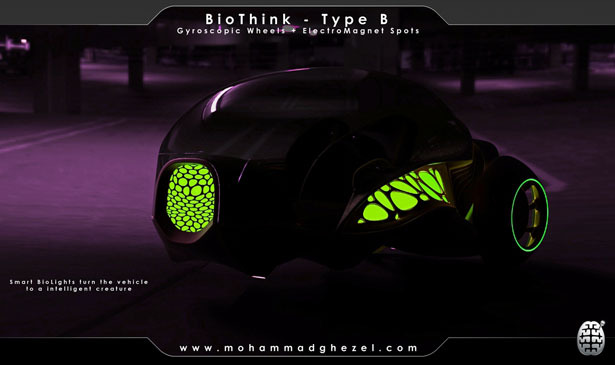 BioThink is a smart, safe and clean vehicle to use with wide view of display and greenhouse. 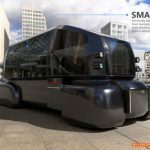 In the future, we’ll face vast variety of devices and technology that make our life easier, thus including the transportation system. 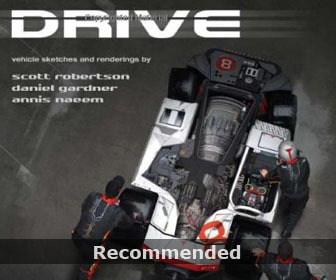 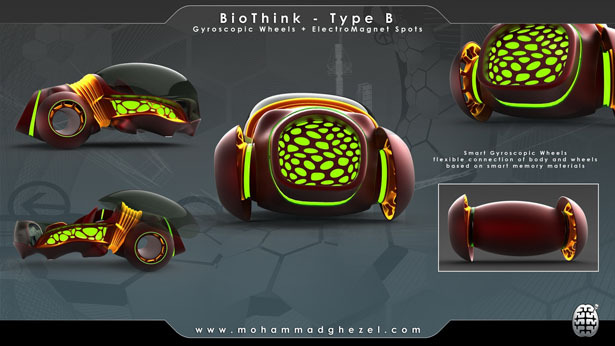 Tuvie has received “BioThink Futuristic Vehicle” project from our ‘Submit A Design‘ feature, where we welcome our readers to submit their design/concept for publication. 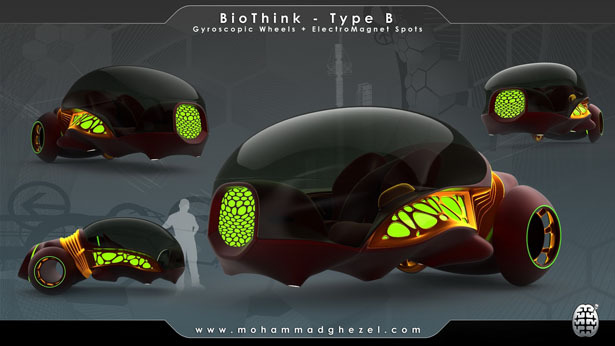 Tagged as electricity, intelligent traffic, mega cities, mohammad, sustainable transportation, traffic system, transportation system.